I remember when I first started dating Juan we met some of his friends at a Jazz fest and they started talking about traveling throughout South America. 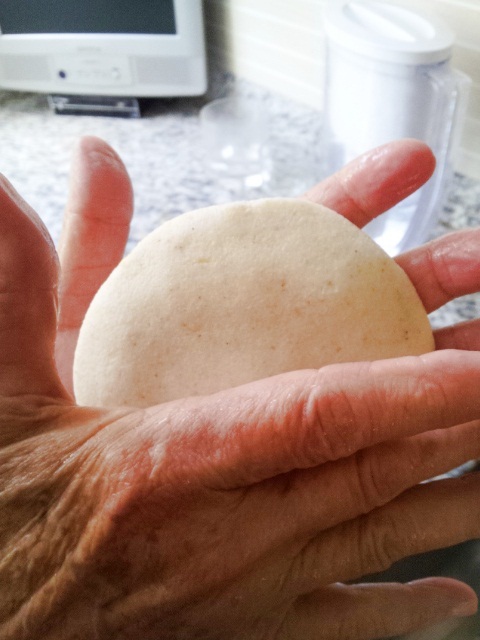 One particular woman was so excited about the arepas in Venezuela that she was salivating. Me? Well I was instantly put off by the name. A-repa. 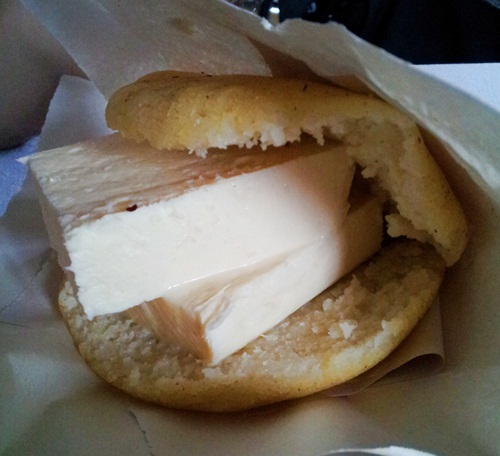 Less than a year later I was in the land of arepa. You’re probably asking yourself, what exactly is an arepa? I thought it might be time for a little explanation seeing how it’s part of my blog name. It’s made from a finely ground corn flour, shaped into puffy disks and can be eaten with just about anything, at any time. The easiest way for me to put it into context would be to say it’s as important to Venezuelans as bread is to the rest of us. Think of it as their equivalent to the sandwich, albeit the savory kind. 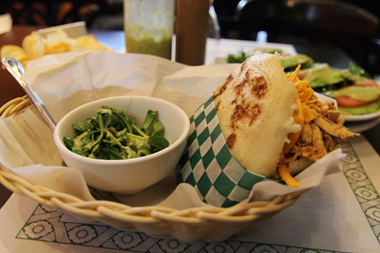 Most arepas are filled with cheese, shredded beef, plantains, beans, avocado or a mixture of all the above. 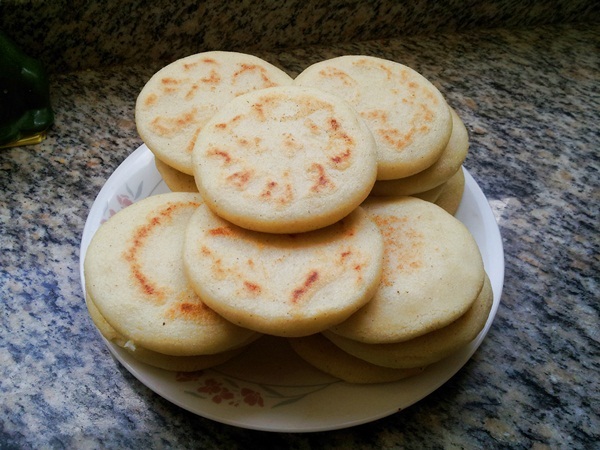 Juan’s mom makes arepas at lightning speed! By the time I’ve tried to round out one, she’s on her 10th. Once here, I was excited to try it. I mean it would be part of my daily diet and the possibilities sounded endless. I tried it and much to everyone’s surprise, didn’t like it. Juan’s mom just couldn’t wrap her head around the reason why. I don’t know, there was something about the texture I didn’t like; it was soft and spongy. That was it, I didn’t eat another one for the remainder of my time here. It doesn’t sound like a big deal, but it’s kind of like going to Asia and never eating noodles. Well all of that changed 2 years later when I’m sitting at a friend’s place (in Montreal) and her brother in law sets down a huge basket of arepas to accompany the best tasting cilantro garlic chicken I’ve ever tasted in my life. These little corn discs were crunchy on the outside and a little doughy on the inside. Good thing for second chances because the little arepa was redeemed! Oh the irony. Areperas (arepa restaurants) here are like Subways or MacDonald’s. There is one on every corner and they’re cheap! They’re the go to meal/snack. They’re also something that you eat and it keeps you full until your next meal. I can only ever eat one; that’s how filling they are. My favorite is filled with the humble avocado. 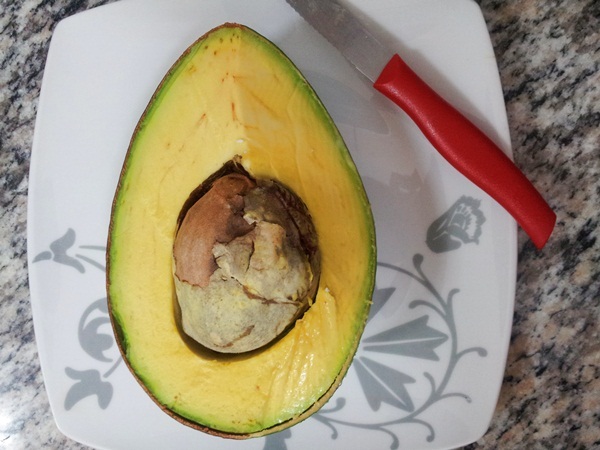 The rich, creamy texture of the avocado is perfect for the crunchy arepa. 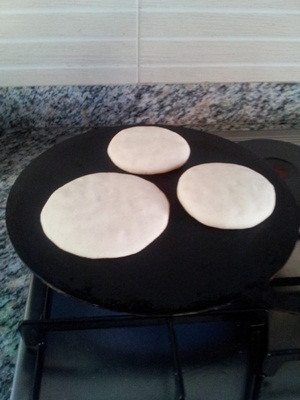 If you live in a multicultural city, you can find “harina pan” and make your own. If Just follow the directions on the bag and your dough will be perfect. Well almost, you need to add a bit of salt. Juan’s mom, like all good mom cooks, doesn’t measure anything. So until you’re a pro, I’d stick with the instructions. 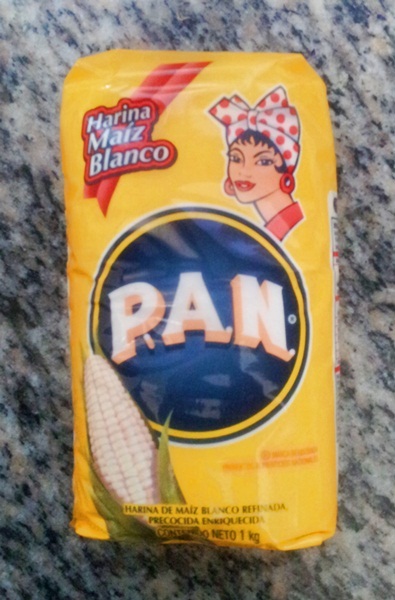 Harina pan translates as bread flour. This is the only brand in Venezuela. After making the pucks, the best thing to do is to fry it on both sides in a tiny bit of oil until crispy and then put them in a warm oven. Having made these for over 70 years, Juan’s mom taps them to know if they’re done. Apparently if they sound hallow, they’re cooked. To be on the safe side, I’d say bake them for about 10 minutes. Experiment with fillings and enjoy something new. Juan likes his fluffy and I like mine flat. And if you are lucky enough to live in Montreal, check out La Arepera du Plateau. My friend’s brother in law opened his own family run Arepera with huge success. I can tell you first hand that the food is authentic and the arepas are fantastic. Buen provecho! Photo courtesy of Arepera du Plateau. YUM YUM YUMMMMM!!!!! Where can I get one in Vancouver???!!! Yup, delicious. The place we used to go to is now closed, but I looked online and there’s a place called Magda’s. http://magdasrestaurant.ca/ It looks like it’s Colombian, Venezuela and Ecuador (only because of the pupusa’s). Judging by the pictures, the arepas, pabellon (shredded beef, rice, black beans and plantain) and the pupusa’s look good. I’ve never seen a fried egg here (I guess they’re catering to the North American client). They make perico which is like wet scrambled eggs with various ingredients. Try is out and let me know what you think! I’m curious to know. Ooooh!!!! Thanks!!! I’ll definitely go scout it out + report back to you! I LOVE PUPUSAS!!!!! !